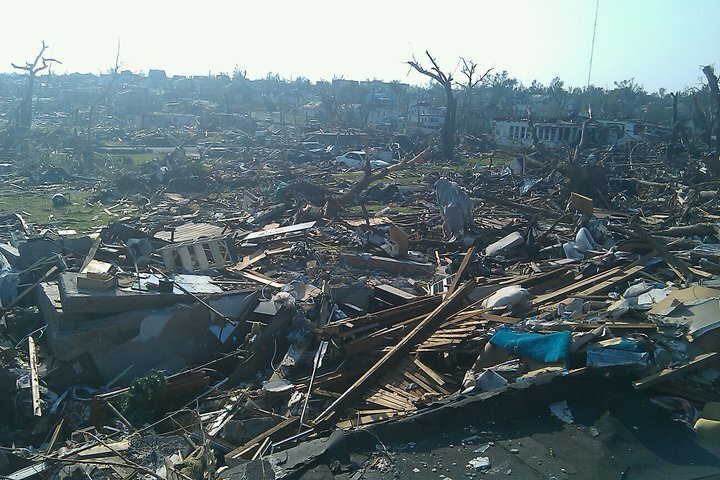 On Sunday May 22, 2011, @ 5:41 pm, one of the largest, most devastating EF-5 tornados on record landed in Joplin MO. The almost one-mile-wide tornado touched down for an estimated six ½ minutes and when it was done, around 8000 homes and buildings were destroyed, hundreds were injured and the death toll was climbing. To date, the death toll has reached around 150. My son Bryce and I just returned from a week of volunteering with the relief effort. We joined a team from Buffalo and went to work with Franklin Graham’s Disaster Relief Ministry “Samaritan’s Purse”. We spent a week working with hundreds of others from across the nation assisting homeowner’s in the beginning of debris removal and rebuilding. Primarily, we were helping to clean up the mess. Rebuilding cannot truly start, until the removal of rubble is complete. Good question. Maybe a great question. Perhaps even “THE” question. As I thought about that question in the light of the week I had just experienced, I could not help but ponder something. Is that not the question that secretly twists and turns in stealth like fashion through the hearts and minds of every human on the planet. Not just when doing disaster relief work, or being on a missions trip, or working on some type of outreach to our communities. But every day. Living normal life. Just getting up and doing what we do, then laying our heads on our pillows at night. Don’t these questions continue to churn through our being: Am I making a difference? Does my life count? Did today even matter? Just a thought. One I will continue to ponder. But for now, let me attempt to answer the question of questions through the prism of my personal experiences and observances of others that I experienced while in Joplin, MO. Day 1 in Joplin began with our first drive into the epicenter of the destruction. We were staying in a church that was one mile away. In the church and surrounding area the only sign that a tornado had occurred was the presence of relief volunteers, organizations and relief provision. There was an abundance of food, water, portable showers, clothing and other household items available for whoever had a need. However, the buildings, streets, stores, homes, churches in this area looked as normal as before the tornado had come. I did not see the visible sign that anything had occurred. Until… we drove one mile over. That’s all. One mile. Because one mile over was the beginning of what I was not prepared to see. As we drove into the destruction zone, silence invaded our van. Eyes were taking in what we had only seen on TV or the internet. It always seems so far away on television. Almost unreal. But here it was. We stopped. We had a job today. A homeowner without a home had requested our assistance in beginning to clean up the mess. I stepped out and tried to hide behind my big dark sunglasses. This worked for only a moment, for the tears insisted on making their appearance. The only physical response that matched the heartbreak inside. And we began… cleaning up. Digging through what was once a home. Dividing the debris for removal. Wood in one pile. Metal in another. Appliances, if there, in their own section. Any personal items thought to be of value or of a sentimental nature were put aside for the owners. So began a week of digging through the rubble of people I did not know, in an attempt to assist in helping them begin the process of rebuilding their lives. After we cleared a property for one homeowner, our team of fifty volunteers that day gathered around to pray for him and his wife. In addition, Samaritan’s purse provides an incredible Billy Graham Study Bible that we all signed. We prayed and presented the Bible. The man began to weep as he thanked us for our help. This man had about a 5 acre piece of property. On the back of the property, there were three trailer houses that he rented out. During the tornado, one trailer was picked up in the air, spun around three times and landed upside down. The tenants were in the trailer when this happened and none of them were hurt. Miraculous! Also, the home owner had a friend that came out and worked with us in helping to clear the property. When we all gathered together, the friend shared how his own house had burned down over two years prior. He told us that the man we all helped had spent almost every weekend for the last two years helping him rebuild after the fire. He said now God was paying him back by sending all of us to help. We saw homes where nothing was left but a stairwell, and that was where the family gathered and they all lived. We cleared one house that had a storm shelter in the front porch. The family had never used the shelter in ten years. But the dad felt like they were supposed to this time. Because of this, the family lived. The front of the house totally collapsed on top of the shelter when the tornado came through and the family, though safe, were trapped after the tornado was over. Their neighbor came by and dug them out. The entire family was saved. Another homeowner we helped shared how her husband had been the only one home. A wall collapsed over him, but instead of killing him, it was what held him down and kept him safe. Again, miraculous. Well, I don’t claim to have all of the answers, but all I can share is what I saw, and the stories we were told. We heard one story of a lady who had been estranged from her adult children. During and right after the tornado, her children attempted to contact her. They had not talked in years. They were unable to reach her and feared the worst. Unbeknownst to them, their mother had been out of town. When she came back home, a few days after the tornado, she went to see how bad her home was. It was demolished. However, when she arrived, she found her adult children in her front yard, cleaning up the debris. They ran to each other, hugged and cried. Just thankful everyone was alive and well; their relationship was instantly healed and restored. The lady called the Pastor of the church we stayed at to share her story. This was the amazing thing I witnessed; in the midst of tragedy and devastation, we saw and heard so many miraculous stories. People who were supposed to be home but were delayed, and because of the inconvenience, were now alive. I can remember arriving at one property to begin cleaning up. A volunteer looked at the mass accumulation of trees and debris and exclaimed, ” Where do we start?” Almost as soon as she asked, another volunteer member went and picked up a piece of wood and began walking it to the curb. That simple act said it all. Our team of volunteers cleared that property that day. But it started by picking up the first piece. Meeting many of the home owners and hearing their stories was amazing. I could go on and on for paragraphs at a time. I saw God working through volunteers from all over the country. I saw God in the eyes of people who lived through the tornado and were so thankful to be alive. I saw God in the cooperation of strangers, neighbors, families and acuaintences unified by the hope of rebuilding after the storm. So did we make a difference? … absolutely, but it was because we were a part of a mass army of volunteers who were pouring out their lives, time, energy, finances and love. And, strangely, in the midst of tragedy, I saw, sensed, felt, and observed God at work. Out of the ashes, beauty is rising. Out of tragedy, compassion is flowing. Out of heartache love is being reborn. The lives of my son Bryce and I were changed forever. We were deeply moved by the people of Joplin, by the outpouring of love and by the Grace of God that was undeniable. My heart and prayers will continue to be with the people of Joplin, and I look forward to going back and seeing the miracle of a town rebuilt. Please continue to pray for Joplin, donate money to relief organizations such as Samaritan’s Purse, and consider going to volunteer. God Bless Joplin. Daryl, thanks again for inviting me to come along. It was great to serve with you.